At the time of his death at age 36, Lautrec’s oeuvre consisted of 5000 drawings, 350 lithographs and 500 paintings. Lautrec suffered from a late form of dwarfism called psycnodysostosis, a condition in which one’s arms and legs don’t grow properly, the face gets coarse, and the lips thicken. As an artist, Lautrec changed the way his viewers looked at Paris. With the honesty of a plein-air painter and the realistic style that characterized the Barbizon painters’ view of nature, Lautrec laid bare the underbelly of Parisian nightlife. Like the Impressionists Degas and Raffaelli, Lautrec was one of the first to start the revolutionary affect whereby the elements of social consciousness became as important as psychological representation, and in combination created a storyline. It is the creation of an emotional reaction by the combination of these two factors that moves art into the modern age. Lautrec was to lithography what Rembrandt was to etching. Like Rembrandt’s revolutionary self-portraits, which for the first time showed the patchwork of human expressions, Lautrec also animated the face for joy, sorrow, surprise. 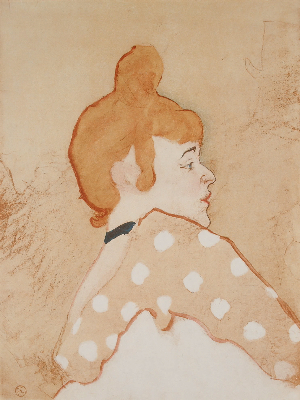 Lautrec’s series of paintings of Carmen Gaudin (c. 1880s) show her in a range of emotions, such as the distrustful suspicious expressions which characterized his early portraits of her. Although she was Lautrec’s model, and a model only, he was masterful at posing her in different persona’s such as the laundress or a prostitute (in the painting Boulevard Exterior). He was able to embody the character in keeping with Bruant’s latest song about this very element. Lautrec was so masterful that by only the slightest, most subtle manipulation of Carmen’s pose he was able to capture the feelings of fatigue and anxiety and lead the viewer immediately to understand Carmen’s purpose. In 1884 he established a studio in Montmartre and plunged into the nightlife, sketchbook in hand; he taught himself but was considerably influenced by Degas. He exhibited in Brussels with Les Vingts from 1887 and at the Salon des Indépendants from 1889. In the 1890’s he took up lithography producing some superb posters, notably for Artistide Bruant’s cabaret, and working for various publications. In 1895 he made first of several visits to London, where he knew Wilde and Beardsley. He was highly sensitive to jibes about his stunted growth, and drank heavily; in 1899 his health collapsed and he retired to a nursing home. From this period dates his series of circus pictures. After recovering, he lived mainly in Bordeaux, working industriously, but he died two years later. Not greatly appreciated in his lifetime, his work began to gain international renown after the retrospective exhibition at the Goupil Galleries in 1914.